Winter, Josh Cullen, a Darby foray. 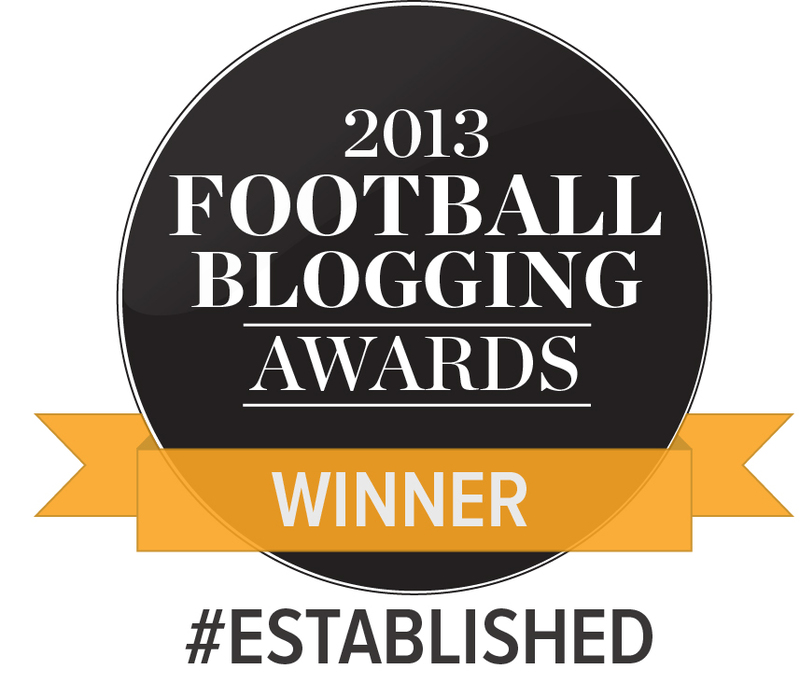 Good heavens, Lee Evans and Tony Mac gloats. Okay, so I’m definitely no Ian Dury (perhaps a blockhead), but it certainly is time to be feeling more positive about things! The win at Blackpool at the weekend has capped off an impressive February for Phil Parkinson’s side, and hopefully provided a launch pad for a play off push that seemed to be slipping away not so long ago. What has been pleasing has been the greater positivity and tempo in the side and the Bantams have melded a greater potency up front with the trademark watertight defence at the back. In the 23 league and cup matches commencing with the 0-0 draw at Millwall on 31 October 2015, City have managed 15 clean sheets. It has been fantastic to see Ben Williams more than answer his early season critics, and he has made a number of key stops, especially during the past few matches – the save on Saturday where he tipped Mark Yeates’ curler onto the bar, was vital in the context of the overall match and the eventual win. Attack-wise, the five league games in February have yielded 10 goals; tellingly the 10 goals have been garnered from 66 shots – a marked improvement on the 1 in 10 shots to goal ratio statistic that was bandied around at the end of January. 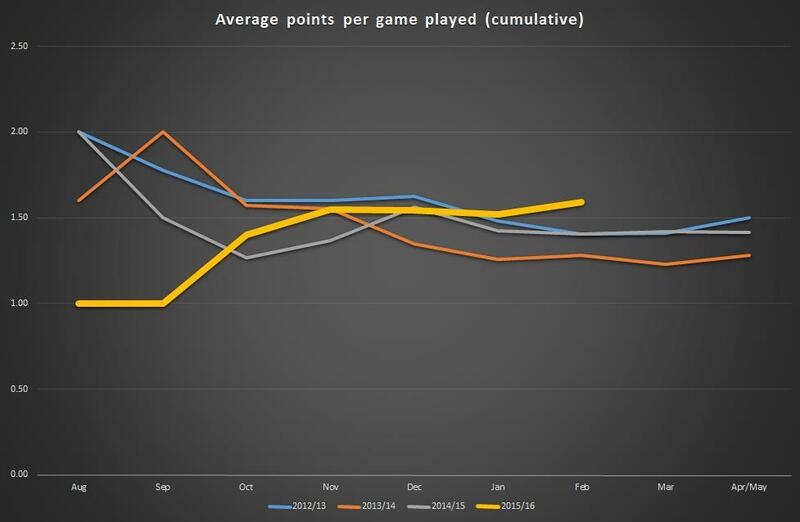 To underline the importance of the February upturn, the following is a summary of average points per game for the season to date against the previous three seasons (and the eventual outcome for each of the three previous full seasons). Interestingly, if City are able to at least maintain the current average points per game ratio (1.59), then this would result in a 73 points haul – and well into play off territory. What the table also shows is that from this stage on in the last few seasons, City have either gone on to maintain or improve the average points per game (as expected, the promotion season of 2012/13 shows a noticeable improvement as the season reached a crescendo and a play off place). 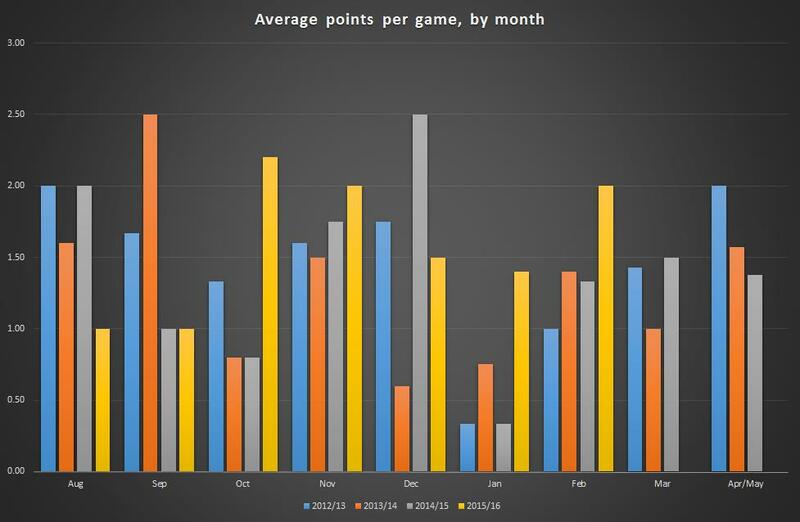 The graph below illustrates the improvement in the average points per game, as the season has progressed, compared to previous seasons. As a result the current trajectory looks promising. Whilst compiling this data, I did wonder if there was any pattern to the monthly performance across the season. For example, the perceived middle of the season ‘blip’ and January in particular ‘feels’ to generally be a difficult time for the Bantams. Accordingly, the data by month below shows that this season has differed somewhat from the usual typical Parkinson team blueprint (ie the start strong, have a blip in the middle, finish strongly model). The current season has so far seen a slower than normal start, a much stronger October and November, and better than average last couple of months – indeed the normal January nightmare month hasn’t been repeated to the extent usually seen. But we all know games of football aren’t played on graphs or spreadsheets! U’s boss Kevin Keen, who took over from Tony Humes just before Christmas, has yet to taste a league victory in the hot seat, and will be looking to do all he can to pick up a side currently propping up the division. Recent transfer activity has seen Colchester tread a similar path to the Bantams, signing West Ham defender Leo Chambers and Tottenham winger Nathan Oduwa on one-month loans. Chambers, 20, has made three League Cup appearances for West Ham in 2013. Oduwa, 19, spent the first half of this season on loan at Rangers, making 15 appearances and has also had a loan spell at Luton. Chambers made his first Colchester start in Saturday’s 0-0 draw with Shrewsbury, with Oduwa coming on as late substitution. Phil Parkinson will select from a squad nursing injuries from the weekend clash at Blackpool. Steve Davies must be cursing his luck after suffering another knee injury, and it is hoped the big striker is not sidelined for too long, particularly as he was working his way back into the City team. Reece Burke (twisted ankle) and Wes Thomas (calf) are also doubts with Nathan Clarke, and probably Billy Clarke, standing by as replacements. After a man of the match performance against Blackpool, the tenacious midfield dynamo Josh Cullen will continue his impressive start at City. Without dwelling on previous disappointments in similar scenarios of facing the underdog (and yes, I know there are plenty!) City have given themselves a great platform to push on, but will need to be very wary of the threat that a supposedly down and out Colchester side may offer. Memories of the disappointing 2-0 defeat down at Layer Road at the end of September last year, are still strong both those who travelled down on the Tuesday night, not to forget those who experienced the Valley Parade ‘beam-back’. As Bob Dylan once said “Expect the worst and you’ll get it. That’s all I ever learned….”; now might well be the time to pay heed to this!